When we say Maraschino, most of you will think of childhood—those glowing, almost unnaturally red cherries that perch on a sundae’s whipped cream or garnish a Shirley Temple. But today we’re talking about something quite different. Maraschino liqueur is made from the Marasca cherry, which grows in northern Italy and Croatia. The liqueur’s taste is very distinctive: It is made from the whole cherry—pits, stems and all—leaving it sweet but with a bitter backbone. Maraschino is a little nutty, a little fruity and unlike anything else. 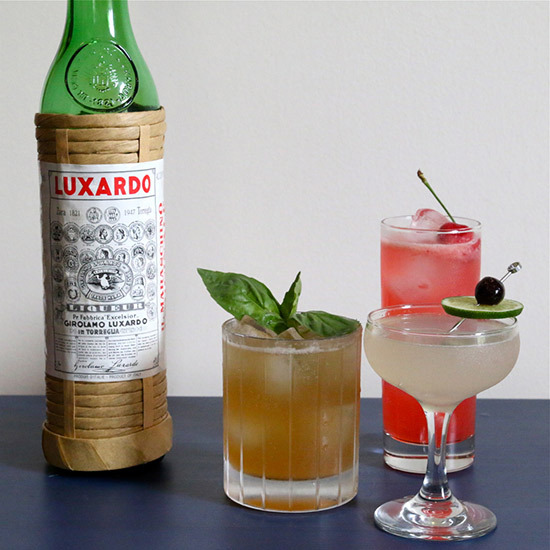 (There are a number of brands available, but Luxardo Maraschino is the one you’ll find on the shelf at most cocktail bars out there.) It’s a key ingredient in a number of classic cocktails—the Aviation and Hemingway Daiquiri among them—and therefore is a must for any cocktail enthusiast. Here are three cocktails to make with Maraschino and just a few extra ingredients: some traditional, some totally original. A classic, thanks to our friend (and prodigious alcoholic) Ernest Hemingway, who was said to down a dozen or more of these on rum-soaked afternoons in Cuba. Fresh grapefruit and lime juices are key here. Instructions: To a cocktail shaker with ice, add 1½ ounces of good white rum (we like Brugal Extra Dry), ½ ounce of grapefruit juice, ½ ounce of lime, ¼ ounce of simple syrup (equal parts sugar and water) and ½ ounce of Maraschino. Shake all that up and strain it into a cocktail glass. Garnish with a lime wheel. Since Maraschino is such a multifaceted ingredient on its own, it lends complexity to otherwise simple cocktails, like this shaken drink of bourbon and lemon. Basil adds a bit of summertime herbal freshness. Instructions: In a cocktail shaker with ice, combine 1½ ounces of bourbon (we like Buffalo Trace), ¾ ounce of Maraschino, 1 ounce of freshly squeezed lemon juice, ¼ ounce of simple syrup (equal parts sugar and water) and a dash of Angostura bitters if you have ’em. Add five whole basil leaves. Shake all that up hard, then double strain (though a fine mesh strainer) into a new glass with fresh ice. Add a splash of soda and garnish with basil. Maraschino is made from cherries, after all, and this vividly colored (and vividly flavored) summer sipper plays up that connection. Use the best, sweetest cherries you can find for this drink: It’s cherry season, so take advantage. Instructions: In the bottom of a cocktail shaker, muddle (translation: smash up) five pitted cherries. Add ½ ounce of Maraschino, 1½ ounces of vodka (or white rum, if you’d rather), ¾ ounce of fresh lemon juice and ¼ ounce of simple syrup (equal parts sugar and water). Shake all that up hard, then double strain (though a fine mesh strainer) into a tall glass with fresh ice. Add a splash of soda and stick a cherry on top.